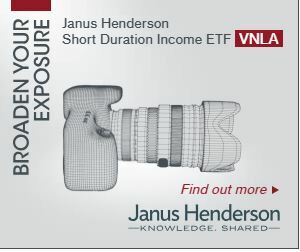 Exchange Trade Fund UVXY is a 1.5X leveraged fund that tracks short-term volatility. To have a good understanding of UVXY (full name: Ultra VIX Short-Term Futures ETF) you need to know how it trades, how its value is established, what it tracks, and how ProShares makes money running it. UVXY trades like a stock. It can be bought, sold, or sold short anytime the market is open, including pre-market and after-market time periods. With an average daily volume of 47 million shares its liquidity is excellent and bid/ask spreads are a penny. It has an active set of options available, with seven weeks’ worth of Weeklys and close to the money strikes every 0.5 points. Like a stock, UVXY’s shares can be split or reverse split. 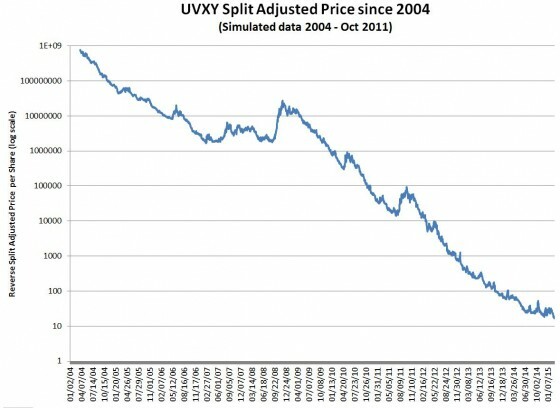 If fact, UVXY reverse split 5 times in its first four years of existence—which may be a record. See this post for more details on historical and predicted reverse stock splits. UVXY can be traded in most IRAs / Roth IRAs, although your broker will likely require you to electronically sign a waiver that documents the various risks with this security. Shorting of any security is not allowed in an IRA. How is UVXY’s value established? Unlike stocks, owning UVXY does not give you a share of a corporation. There are no sales, no quarterly reports, no profit/loss, no PE ratio, and no prospect of ever getting dividends. Forget about doing fundamental style analysis on UVXY. While you’re at it forget about technical style analysis too, the price of UVXY is not driven by supply and demand—it’s a small tail on the medium-sized VIX futures dog, which itself is dominated by SPX options (notional value > $100 billion). According to its prospectus, the value of UVXY is closely tied to 1.5 times the daily return of the S&P VIX Short-Term Futurestm This index manages a hypothetical portfolio of the two nearest to expiration VIX futures contracts. Every day the index specifies a new mix of VIX futures in that portfolio. For more information on how the index itself works see this post or the UVXY prospectus. The index is maintained by S&P Dow Jones Indices. The theoretical value of UVXY if it were perfectly tracking 1.5X the daily returns of the short-term index is published every 15 seconds as the “intraday indicative” (IV) value. Yahoo Finance publishes this quote using the ^UVXY-IV ticker. Wholesalers called “Authorized Participants” (APs) will at times intervene in the market if the trading value of UVXY diverges too much from the IV value. If UVXY is trading enough below the IV value they start buying large blocks of UVXY—which tends to drive the price up, and if it’s trading above they will short UVXY. The APs have an agreement with ProShares that allows them to do these restorative maneuvers at a profit, so they are highly motivated to keep UVXY’s tracking in good shape. Ideally, UVXY would exactly track the CBOE’s VIX® index—the market’s de facto volatility indicator. However, since there are no investments available that directly track the VIX ProShares chose to track the next best choice: VIX futures. VIX Futures are not as volatile as the VIX itself; solutions (e.g., like VXX) that hold unleveraged positions in VIX futures only move about 45% as much as the VIX. This shortfall leaves volatility junkies clamoring for more—hence the 1.5X leveraged UVXY and 2X leveraged TVIX. ProShares achieves the 1.5X daily return by taking advantage of the fact that VIX futures only require a small percentage (e.g. typically less than 25%) of their face value be deposited as margin to purchase the contract. By doubling up the number of contracts they own they can double the returns. To keep this leverage near a constant 1.5X they have to adjust the number of futures contracts held by the fund at the end of every trading day. This adjustment is essentially a compounding process. If you want to understand how leveraged funds work in detail you should read this post, but most importantly you should know that the 1.5X leverage only applies to daily percentage returns, not longer-term returns. For a leveraged fund, longer-term results depend on the volatility of the market and general trends. In UVXY’s case these factors usually (but not always) conspire to dramatically drag down its price when held for more than a few days. The leverage process isn’t the only drag on UVXY’s price. The VIX futures used as the underlying carry their own set of problems. The worst being horrific value decay over time. Most days both sets of VIX futures that UVXY tracks drift lower relative to the VIX—dragging down UVXY’s underlying non-leveraged index. This drag is called roll or contango loss. The combination of losses due to the 1.5X structure and contango losses add up to typical UVXY losses of 10% per month (70% per year). This is not a buy and hold investment. 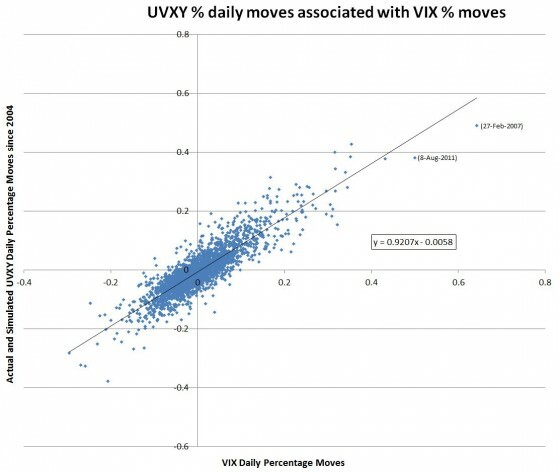 On the other hand, UVXY does a good job of matching the short term percentage moves of the VIX. The chart below shows historical correlations with the linear best-fit approximation showing UVXY’s moves to be about 92% of the VIX’s. The data from before UVXY’s inception on October 3, 2011, comes from my simulation of UVXY based on the underlying VIX futures. Most people buy UVXY as a contrarian investment, expecting it to go up when the equities market goes down. It does a respectable job of this with UVXY’s percentage moves averaging -5.96 times the S&P 500’s percentage move. 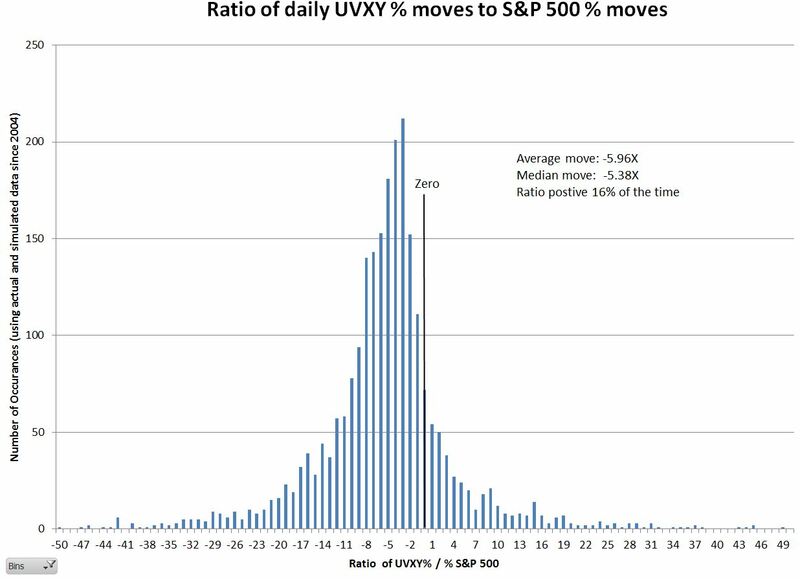 However, 16% of the time UVXY has moved in the same direction as the S&P 500. So please don’t say that UVXY is broken when it doesn’t happen to move the way you expect. With erratic S&P 500 tracking and heavy price erosion over time, owning UVXY is usually a poor investment. Unless your timing is especially good you will lose money. How does ProShares make money on UVXY? As an Exchange Traded Fund (ETF) UVXY must explicitly hold the appropriate securities or swaps matching the index it tracks. ProShares does a very nice job of providing visibility into those positions. The “Daily Holdings” tab of their website shows how many VIX futures contracts are being held. Because of the 1.5X nature of the fund, the face value of the VIX futures contracts will be very close to 1.5 times the net “Other asset/cash” value of the fund. ProShares collects a daily investor fee on UVXY’s assets—on an annualized basis it’s 0.95% per year. With current assets of $700 million, this fee generates around $6 million per year. That should enough to cover ProShares UVXY costs and be profitable, however, I suspect the ProShares’ business model includes revenue from more than just the investor fee. “A portion of each VIX Fund’s assets may be held in cash and/or U.S. Treasury securities, agency securities, or other high credit quality short-term fixed-income or similar securities (such as shares of money market funds and collateralized repurchase agreements).” Agency securities are things like Fannie Mae bonds. The collateralized repurchase agreements category strikes me as a place where ProShares might be getting significantly better than money market rates. With UVXY currently able to invest around $350 million this could be a significant income stream. According to ETF.com’s ETF Fund Flows tool, UVXY’s net inflows have been around $1.8 billion since its inception in 2011. It’s currently worth $700 million, so ProShares has facilitated the destruction of about a billion dollars of customer’s money—so far. I’m confident the overall destruction trend will continue. UVXY has escaped the negative publicity that Barclays’ VXX and VelocityShares’ TVIX funds have generated, but as it continues to grow in size and continues to destroy shareholder value at eye-watering rates it’s probably a matter of time before UVXY starts getting vilified on its own merits or lack thereof. UVXY is like a loaded gun, effective when used at the right time, but dangerous if you leave it lying around.